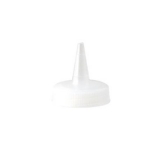 Clear, flexible, soft plastic narrow-neck bottle with screw top (pack of 6). Use for dispensing sauce or decorating. 8oz / 240ml capacity.